I love balloons and so do my children. They brighten parties and make people smile. But lately I’ve begun to look at balloons in a different way and I honestly don’t like them much anymore. It’s amazing that the process of engaging in the conversation about “going green” affects nearly everything in our lives. Am I losing my sense of joy and wonder or am I more focused on our natural world and less on short term pleasures, like balloons and fireworks? 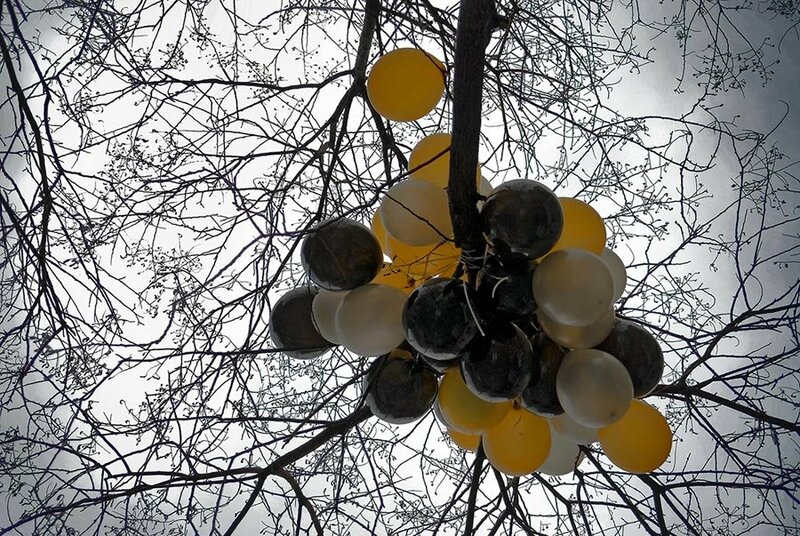 How do we decide if the ear-to-ear smiles that come with big balloons are worth releasing trash into the air? Last weekend we were at the beach, walking on a jetty, and there was a Mylar balloon stuck between the rocks with all of its glitter washed away. It looked like a big jellyfish and I thought, “some dolphin or whale will swallow that whole and die.” So we picked it out of rocks and talked with the kids about how dangerous these balloons were to marine life and large birds. My kids got it. So what got me started on this today? I saw this picture, taken in the East Village in 2007 at Manhattan User’s Guide, and it made me think that there are a lot of us out here in Conversationland who are thinking these types of thoughts every day, making changes one decision at a time. No more Mylar balloons at our house. There; that wasn’t very difficult.